If you are identify yourself with those people who wear a breathing mask whenever they go out to the streets or those who hold their nose when a diesel truck passes by them or those who avoid outdoors whenever possible, I am glad you are conscious about your health. But what if I tell you that all these things you do isn’t really going to protect you from the polluted air. You ask why? Because at the end of the day when you come home and undo every protective measure, believing your house to be insulated; you expose yourself to a different kind of danger --- a danger named Indoor Air Pollution. 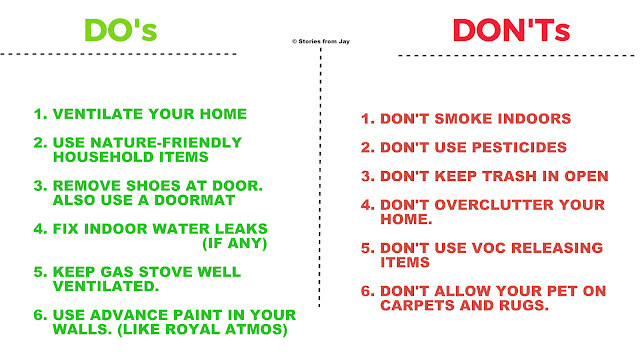 Indoor Pollution is simply the existence of unwanted and harmful particles in the indoors. But the fact that those harmful particles are present in an enclosed area makes it five times more dangerous than normal air pollution. A polluted indoor space has the potential to give you about a dozen diseases which include the likes of acute lower respiratory infections, chronic obstructive pulmonary disease, cataracts, blindness, lung cancer, tuberculosis, premature births and low birth weight. The threat is real and here is a little fact to make you believe. Inadequate ventilation: This is a primary cause of indoor air pollution. Improper ventilation in closed rooms will suffocate the air and increase the concentration of pollutants in it. Contrary to the belief that closed ventilation protects the indoors from outdoor pollution, it is necessary to have proper circulation of air in order to send out certain indoor pollutants. Indoor Smoking: Tobacco and Cigarette is extremely dangerous to health. Smoking them indoors leads to the capture of its harmful smoke in the indoors and can affect respiratory systems of all the occupants of the house. 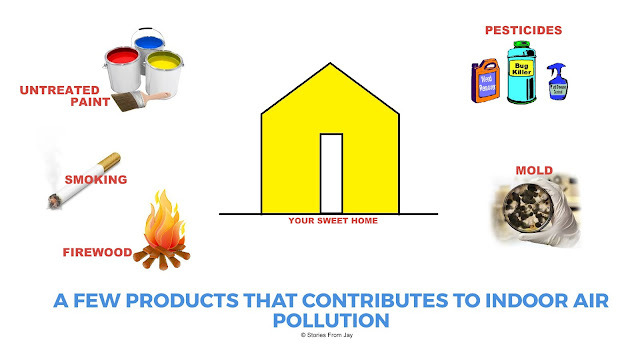 Household Products: A lot of household products contribute to indoor air pollution. New carpets, adhesives and Air fresheners emit volatile organic compounds. Such chemicals are very harmful and are linked to cancer and heart diseases. Pesticides, cleansers, candles and incense sticks also release toxins throughout a house. Mould: Mould is a serious problem of indoor air pollution. Bacteria and varies viruses thrive in it and is the cause of various infections. Electrical Appliances: Heating equipment like fireplaces, heaters and especially gas stoves can produce carbon monoxide which is poisonous in nature. Air conditioners, if not cleaned timely also emits polluting gases. Compact fluorescent lights emit neurotoxins when they are broken. Paint: Untreated paint on walls and furniture emits chemical fumes and can also emit volatile organic chemicals and methylene chloride as they dry. These are extremely harmful to humans. Stay Clean: The best remedy against indoor air pollution is to maintain a clean interior space. Clean off dust from the indoors regularly and mop your floors with water. Additionally, clean your air conditioners, air ducts and chimneys timely. If your house is infected with mould, get it cleaned by professionals that use environment friendly products. Eliminate Sources: Avoid the above mentioned sources wherever possible or choose to minimize/replace them. For example, you can DIY your own safe air freshener by mixing water and essential oils. Keep out the smoke: Do not smoke inside the house. I suggest you quit smoking altogether but if you can’t, step out to the balcony at least. Additionally, minimize the use of candles and incense sticks. Use advance Paint: Use treated paint that does not emit any gases. Or choose AsianPaints’ new Royale Atmos, a paint that not only looks good, but also helps purify air and improve the air quality inside your home. Ventilate: Open your windows so that air circulation can take place. This will also help to maintain the humidity inside. Use nature: Use certain plants to keep your house clean. Plant broad-leafed green plants around the house or place some inside. They add to the decor and keep the air clean too. Use an air purifier: If you have some money to spare, then you can invest on an air purifier. The good ones are now available south of 30k rupees. 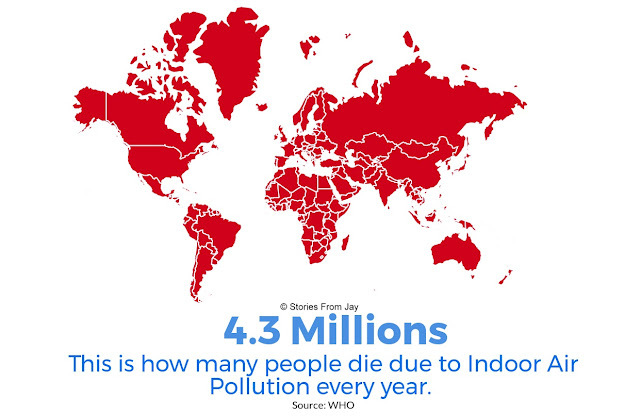 Indoor Air Pollution is a danger and it kills. But with proper steps and the will to live a healthier life, one can run out of its reach. Choose a cleaner life. New thing learnt. 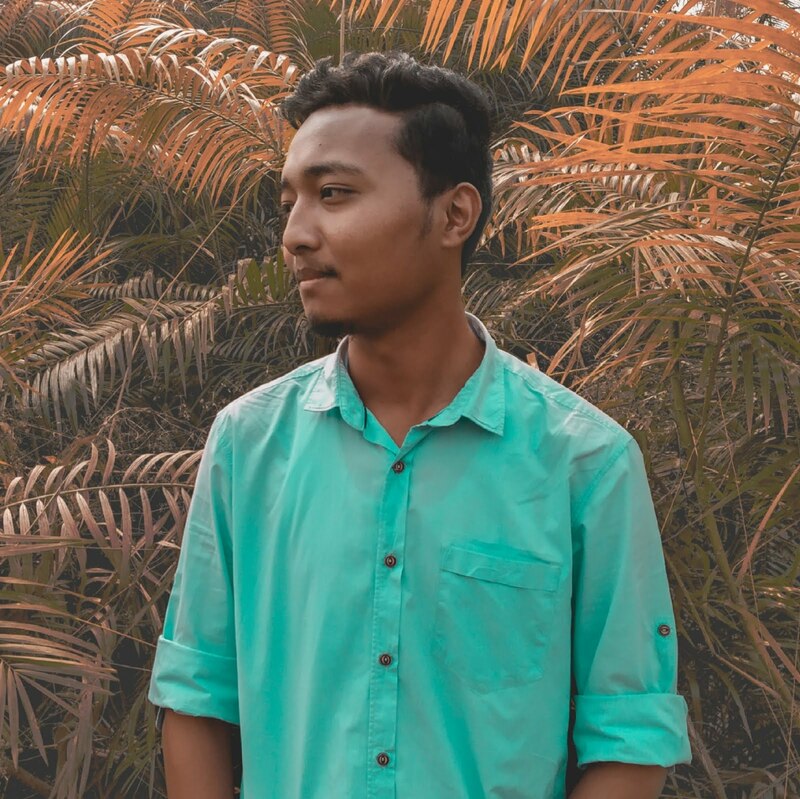 Very well written too.